Fast forward to autumn 2016: It was about time to start looking for a dress. 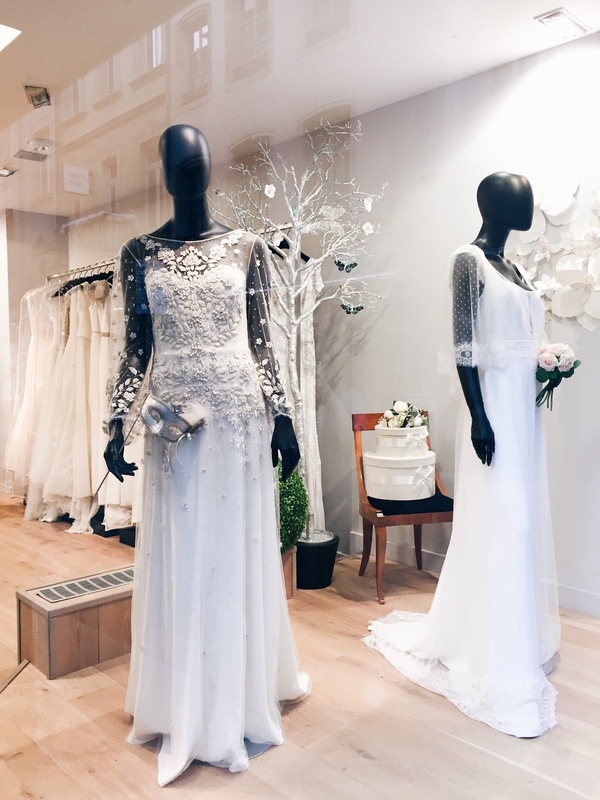 I still had no idea what I wanted, so I went to my first appointment at a bridal store with mixed feelings, torn between excitement and nervousness. Even though I hadn't thought much about the dress until then, it was clear to me that I wanted to find a perfect one and also have the perfect 'I found my dress moment', like in the movies! In retrospect I realize how naive I had been to think I would find my luck right in the first store. The store I had chosen was pretty nice for a first wedding dress experience (after all we got prosecco, even though it came in a can). However the more dresses I tried, the more I realised how hard it would get to find a Pinterest worthy dress. The fact that you have to go to these appointments without makeup doesn't make the whole thing any easier because you'll have to imagine looking like a princess with a face that looks as if you hadn't slept in three days. Well, I don't want to bore you with all the details but let's say that I got more desperate with every store I visited. In store number 3 I was pretty sure that I would have found my luck, but my bridesmaids didn't seem convinced, so we kept looking for an even better match. In store number 6, which had been highly recommended to me, my companions loved almost every single dress, but I just felt disguised in most of them. I got so desperate that I even started crying in front of everybody. That was when I decided to give up on bridal stores. But of course I didn't. I went to number 7 alone, so that nobody would influence me, but all the good dresses I saw there were way out of my budget. That time I really gave up on bridal stores and booked an appointment at a designer, who had created the dress for a friend of the family. I had already accepted the fact that I would never get my bridal dress moment, when my fiancé's mom called me to tell me about yet another store I had to try. I only agreed to go there to do her a favour, but I wasn't confident at all! The only store where we had a room just for ourselves and where I got all the necessary material to try on the dresses (underskirt AND corset). The shop assistant was really professional, but unfortunately she didn't really understand what kind of dress I was looking for, even though she did her best. Maybe it didn't work out because they mostly sold princess or mermaid style dresses, which are just not my cup of tea. Here I could look through all the dresses and choose all those that I wanted to try. Unfortunately the shop assistant was not very empathic. The people who accompanied me also didn't appreciate the fact that they could easily watch the bride who was trying on dresses next to me, which was a bit irritating for them. This company asked me to remove my initial comment, which I only did because I know from my own job how hard it can be to handle negative publicity on social media... However I will not hide any information from a bride-to-be seeking advice via private message! Visiting this store was the biggest waste of time in all my wedding dress adventure. The store is extremely old-fashioned, and so are some of the dresses. Even though the shop assistant was very friendly at first, I didn't like the way she wanted to sell a dress by any means at the end. After I had been there I heard a lot of negative things about the store so it's the only one I would disadvise you to go to. I think this store could have some potential, as I saw some interesting dresses in there. Unfortunately the shop assistant that I had couldn't have been more half-heartedly. She only selected 3 dresses for me and almost didn't allow me to have a look at the others and downrightly avoided to make me try on any more dresses. In the end it felt like we were complimented out of the store. The store is very modern, and so are the vintage style dresses. The shop assistant was very friendly and did her best to find a dress for me. In the end she even wrote me an e-mail to tell me how sorry she was that I couldn't find my luck at her store. Definitely a place to go when you're looking for a bohemian or vintage style dress. Definitely the most instagramable store of all (the picture above was taken there), full of modern dresses that make a little girl dream. Unfortunately they are mostly around 3000€, which was totally out of my budget. Again I had a half-heartedly shop assistant that didn't advise me much, so that I didn't feel like a bride at all. I also noticed that there was make-up smudged on some of the dresses! A no-go for me. The only store where I felt like home and was allowed to look through all of the dresses without being watched and to take as many photos as I wanted. The shop assistant took her time to dress me correctly and explained the possibilities of every dress. After I had found my dress, she also took the time to look through the accessories with me. I definitely recommend going there when the shop isn't as busy as on weekends and to trust the shop assistant as she has all the needed experience.